BlackBerry and Ryan Seacrest are not buds. The first Typo keyboard—an absolutely horrible iPhone keyboard attachment you wouldn't wish on your worst enemy—was just the focus of a lawsuit that cost Seacrest's crew nearly $860,000. 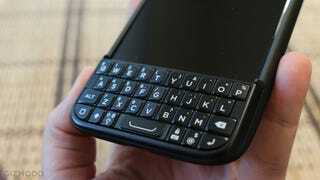 Now BlackBerry is back, and suing them again for the Typo 2. "Just as the did with the Typo Keyboard, Defendants have again copied numerous proprietary designs and patents in the Typo 2 Keyboard. The Typo 2 Keyboard still blatantly copies BlackBerry's iconic keyboard dress designs that have been embodied in numberous BlackBerry smartphones from the 2007 BlackBerry 8800 to the current Q10 and Classic models." Classic on left and Typo 2 on the right. We're not talking multi-million dollar suits here, so the money exchanged isn't really the the point. The fight itself though, is just great. It's like watching the two worst teams in football hammer away at each other on the grid iron like a poor man's Super Bowl. Nothing, and yet everything, is at stake.